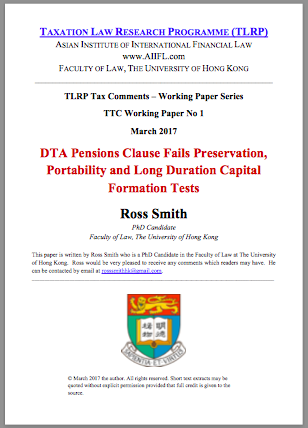 "DTA Pensions Clause Fails Preservation, Portability and Long Duration Capital Formation Tests"
Abstract: Pension accruals for retirement funding are included in domestic assets, then are subject to tax in International transfer transactions, which should not be in the scope of transnational tax avoidance issues. Existing Double Taxation Agreements (DTA) only have a single objective of tax rights, which unfortunately conflicts with the needs of overseas mobile citizens to enable adequate funding of pension retirement income streams, that should function with the ‘Sole Purpose Test’ in respect of SISA1 Legislation under the Australian Constitution’s ‘Pension Powers’ (S51xxiii). An actuarial model may suggest that a funded CPI indexed pension commencing at 66% of pre-retirement salary, should obviate a Government’s liability in the provision of old-age pensions. Regrettably in Australian public administration, there appears to be a co-existence conflict when its taxation regime eliminated its 1946 national pensions scheme that left the Government’s liability unfunded for the provision of old-age pensions. Changing jobs between tax jurisdictions several times before retirement causes pension payments to be taxed and paid out, which is also an opportunity cost to primary capital markets and causes a serious shortage of long duration capital for large scale investment projects. As a partial solution to co-existence conflict, this paper advocates that a ‘Preservation and Portability’ Instrument should be included in Article 17 Pensions Clause in DTAs that preserves pension accruals until retirement age, allows for the tax-free portability transactions between respective tax jurisdictions, supports adequate funding of pensions in retirement, and adds significant economic value to primary capital markets with higher volume, long duration capital formation retention. The retention generates tax revenue as a secondary derivative to successful funding arrangement in the first instance. Click here to download the full paper.